I have a longer Land of the Lustrous piece in the works, so I’m trying not to spill all my ideas from it here. This is the seventh of my entries into 2017’s rendition of the 12 Days of Anime aniblogger project. For more about the project, read appropriant’s introductory post. Please also check out the spreadsheet containing the work of all the bloggers participating! There are many things to talk about when it comes to Land of the Lustrous, but one particular merit of the manga that the anime has highlighted and crystallized is the distinct sense of physicality the gems and their beloved Sensei possess. While both of the distinct elements I want to talk about today exist in the manga to an extent, the benefits of the cinematic medium have allowed the anime adaptation to elevate them to a great position of prominence and importance within the story’s rich thematic structures. 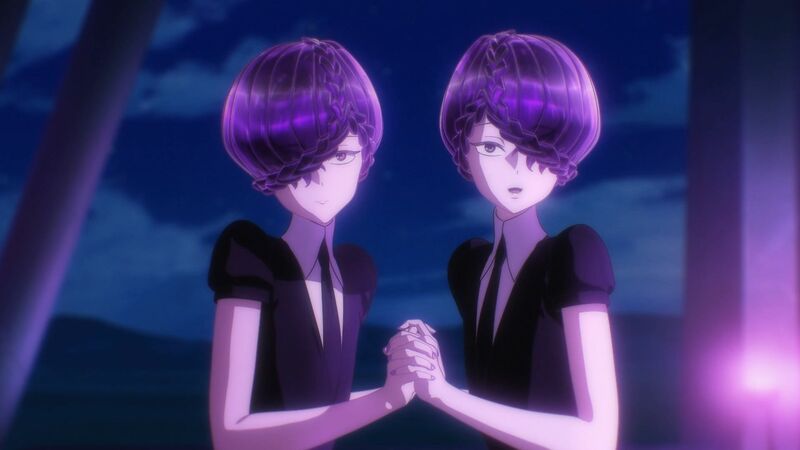 While the Land of the Lustrous manga is defined by isolation via emptiness, the anime adaptation is much more defined by isolation through the juxtaposition of connection and distance. 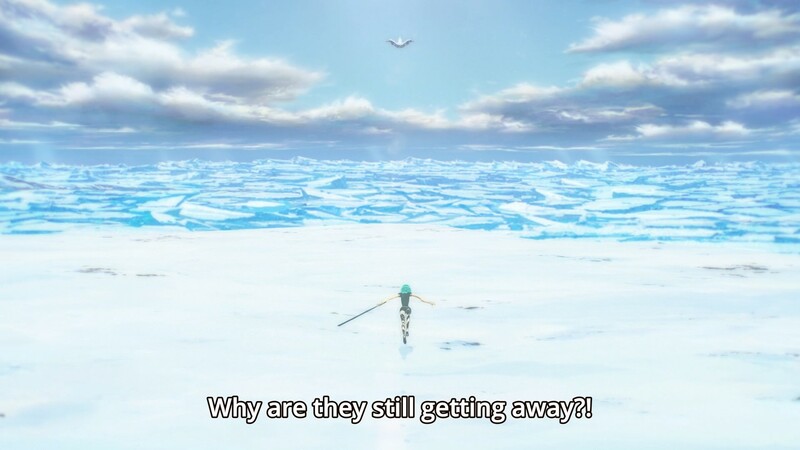 The anime is grounded and physical where the manga is floaty and immaterial. The anime certainly preserves the distinct nature—the “color,” as it were—of the manga, but does so through different means. As is proper as an adaptation. The gems clink when they walk. The Amethyst twins make horrible noises when their heads knock together. 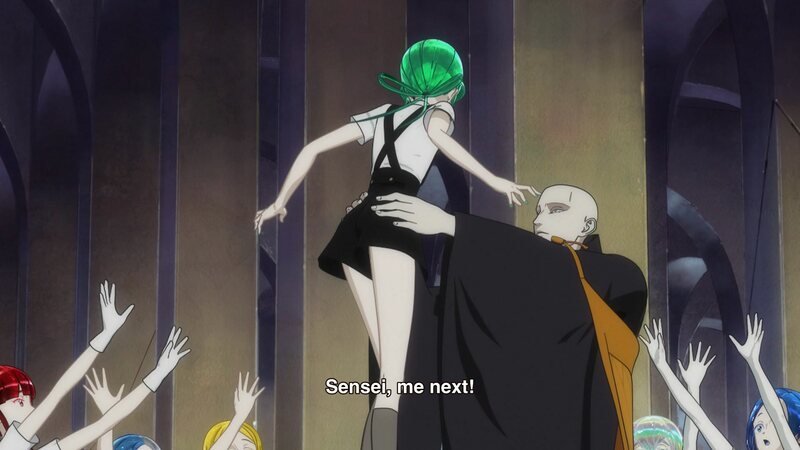 When Sensei places a hand on Phos’s head, there’s a soft sound of contact. 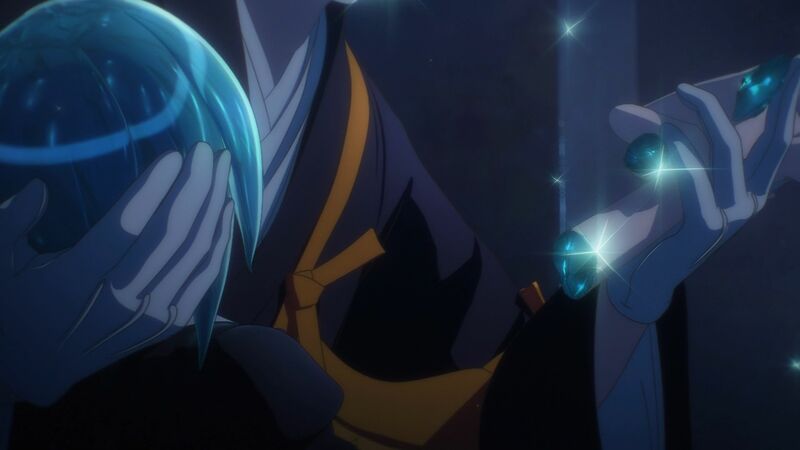 In the Land of the Lustrous anime, the headpat (long a well-beloved anime trope) is more than just a moe gimmick—it’s a communication of affection, care, protection, and, most importantly, connection. While Phos and Cinnabar (and Antarcticite, even) are isolated from the community of other gems, their relationship with Sensei is made very tangible through this physical gesture of love or affection or praise. It holds them in relationship despite their distance from the others. 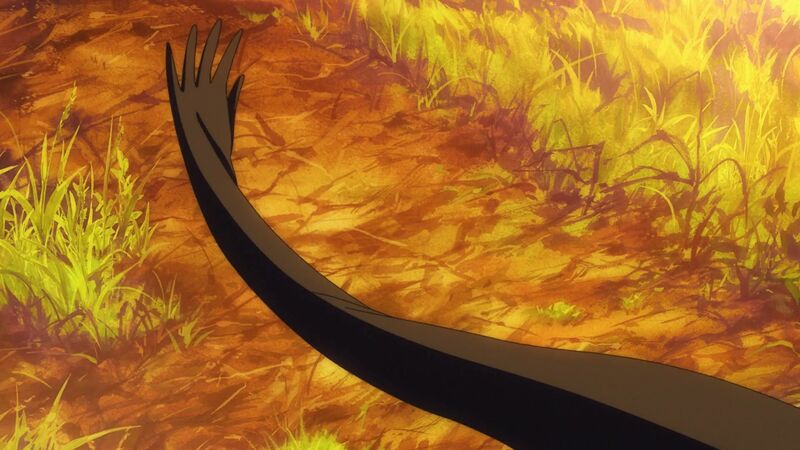 But if headpats are the symbol of connection in Land of the Lustrous, hands represent the opposite. The distance between gems takes on physical form as their hands fail to reachin. 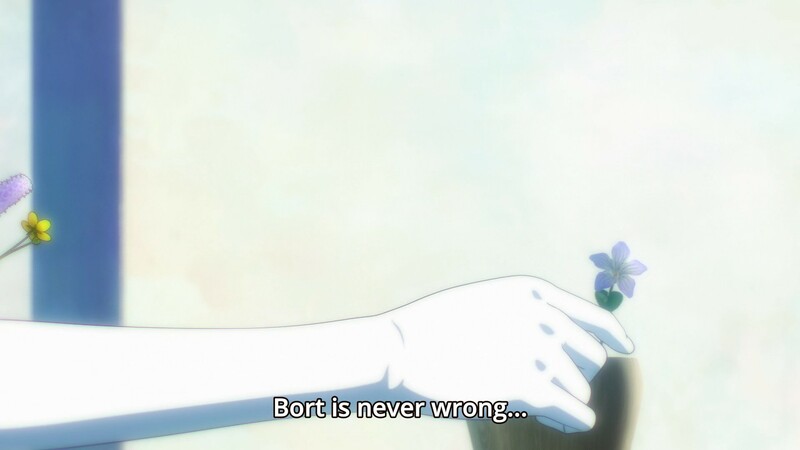 At times, the pairings are nearly sequential (Phos reaching for the Amethyst twins is followed by Bort’s headpat, Cinnabar’s reaching for the flower with Sensei’s gentle hand on their hair). The symbol may be understated in comparison to the show’s other visual delights, but it is not subtle. The image of Phos’s hands after Cinnabar’s rescue (Phos loses their hands trying to save Cinnabar!!) 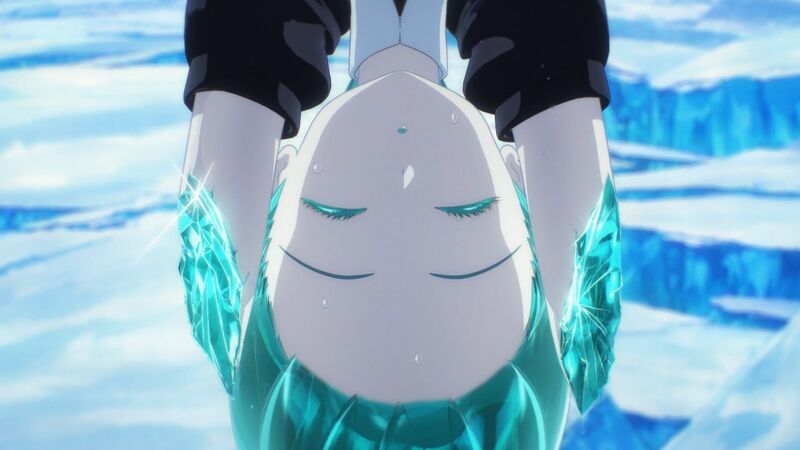 is anime original, and Phos will later lose their hands for good in near proximity to building a relationship with Antarcticite (and their new hands will fail to be enough to save). In an anime of such astounding beauty, remarkable views, and potent feelings, the simple emphasis on the physical being’s need for connections feels especially necessary and valuable. There is such tenderness and gentleness in a touch, such loneliness and horror in the lack thereof. In such a frightening world, the need to connect remains constant and dreadful and wonderful all at the same time. A single loving touch may be enough. An acknowledgment: I skipped my established theme today, but so it goes with Land of the Lustrous. Perhaps my abiding love for a show with such texture is a clue on its own. I was /just/ wondering why you weren’t gushing over LandLust on that podcast episode but I guess you were just saving it for these 12 days posts. You know I’m just gonna need a whole dang podcast to gush over Landlust, Carriage! Although I will have to disagree with the idea that the meaning I explored was “truer” than what you wrote—forgive me for this, I think your thoughts on the quote and what it meant to you are just as (if not more so) valid than mine!